(Health.com) -- Gillian Aldrich started growing vegetables in her backyard three years ago, and she's now working on planting a bed of hydrangeas, butterfly bushes, rose campion, and -- her favorite -- pale-pink hardy geraniums along one side of her property. As she digs in the garden, her 8-year-old daughter and 3-year-old son often play around her, sometimes taking a break to dig for worms or pick strawberries. Instead of watching them, Aldrich is playing, too -- "my kind of play," she says. "When you sit at a desk all day, there's something about literally putting your hands in the dirt, digging and actually creating something that's really beautiful," says Aldrich, 42, a magazine editor in Maplewood, New Jersey. "There's something about just being out there that feels kind of elemental." Aldrich isn't the only one who feels this way. Many gardeners view their hobby as the perfect antidote to the modern world, a way of reclaiming some of the intangible things we've lost in our busy, dirt-free lives. The sensory experience of gardening "allows people to connect to this primal state," says James Jiler, the founder and executive director of Urban GreenWorks, a Miami-based nonprofit that creates garden and park programs for low-income neighborhoods. "A lot of people [understand] that experience. They may not be able to put it into words, but they understand what's happening." "We live in a society where we're just maxing ourselves out all the time in terms of paying attention," says Andrea Faber Taylor, Ph.D., a horticulture instructor and researcher in the Landscape and Human Health Laboratory at the University of Illinois at Urbana-Champaign. Fortunately this "attention fatigue" appears to be reversible. Following a theory first suggested by University of Michigan researchers in the 1980s, Taylor and other experts have argued that we can replenish ourselves by engaging in "involuntary attention," an effortless form of attention that we use to enjoy nature. "The breeze blows, things get dew on them, things flower; the sounds, the smells," says Taylor, herself a home gardener. "All of these draw on that form of attention." In a study conducted in Norway, people who had been diagnosed with depression, persistent low mood, or "bipolar II disorder" spent six hours a week growing flowers and vegetables. After three months, half of the participants had experienced a measurable improvement in their depression symptoms. What's more, their mood continued to be better three months after the gardening program ended. The researchers suggest that the novelty of gardening may have been enough to jolt some of the participants out of their doldrums, but some experts have a much more radical explanation for how gardening might ease depression. Christopher Lowry, Ph.D., an assistant professor of integrative physiology at the University of Colorado at Boulder, has been injecting mice with Mycobacterium vaccae, a harmless bacteria commonly found in soil, and has found that they increase the release and metabolism of serotonin in parts of the brain that control cognitive function and mood -- much like serotonin-boosting antidepressant drugs do. Digging in the dirt isn't the same as taking Prozac, of course, but Lowry argues that because humans evolved along with M. vaccae and a host of other friendly bugs, the relative lack of these "old friends" in our current environment has thrown our immune systems out of whack. "By reintroducing these bacteria in the environment, that may help to alleviate some of these problems," Lowry says. 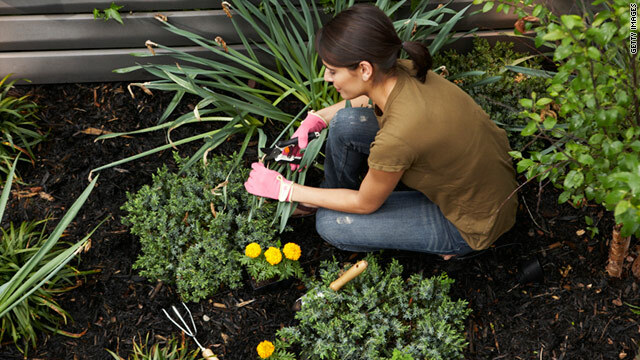 Gardening gets you out in the fresh air and sunshine -- and it also gets your blood moving. "There are lots of different movements in gardening, so you get some exercise benefits out of it as well," says William Maynard, the community garden program coordinator for the City of Sacramento's Department of Parks and Recreation. Gardening is hardly pumping iron, and unless you're hauling wheelbarrows of dirt long distances every day, it probably won't do much for your cardiovascular fitness. "It's not just exercise for exercise itself, which can become tedious," says Katherine Brown, the executive director of the Southside Community Land Trust, a nonprofit that supports community gardens and other urban agriculture in and around Providence, R.I. "It's exercise that has a context, that reinforces the limberness of your limbs and the use of your hands. You've got a motivation for why you want to grip. You're not just gripping a ball, you want to pull a weed." And for people who are already experiencing mental decline, even just walking in a garden may be therapeutic. Many residential homes for people with dementia now have "wander" or "memory" gardens on their grounds, so that residents with Alzheimer's disease or other cognitive problems can walk through them without getting lost. The food you grow yourself is the freshest food you can eat. And because home gardens are filled with fruits and vegetables, it's also among the healthiest food you can eat. Not surprisingly, several studies have shown that gardeners eat more fruits and vegetables than their peers. "People who are growing food tend to eat healthy," says Brown. "The work that we do here with kids demonstrates it on a daily basis, throughout the seasons." Studies of after-school gardening programs suggest that kids who garden are more likely to eat fruits and vegetables. And they're a lot more adventurous about giving new foods a try, says Anne Palmer, who studies food environments as the program director of Eating for the Future, a program based at the Johns Hopkins School of Public Health Center for a Livable Future, in Baltimore. "I've watched a lot of cooking and gardening classes with kids," Palmer says. "It's amazing how many of them will try things like radicchio or some kind of unusual green that has a pretty strong flavor, like arugula, and they'll say, 'Wow, this is good.'" Not to mention that homegrown produce simply tastes better. "It's incomparably more delicious to eat something that's fresh," Brown says. You don't need a big backyard or a green thumb to benefit from gardening. If you have very little space or experience, you can start out with just a few houseplants, or you could even try gardening in containers. "You can grow a wonderful crop of cherry tomatoes in nothing more than a five-gallon bucket that you've cleaned really well and put holes in the bottom of," Brown says. For novices who want to learn the basics of gardening, a huge -- and somewhat overwhelming -- variety of information is available on the Web and in bookstores. But one of the best ways to get started is to meet some other gardeners, who can be found in local garden clubs and community gardens in just about any town or city. For some great gardening tips, just start up a conversation with one of the gardeners next time you are passing by a community garden. "Most will love to share their gardening savvy," Brown says. "That's a really nice way to start."